Camouflage and warm layers aren’t the only clothing you need for hunting. 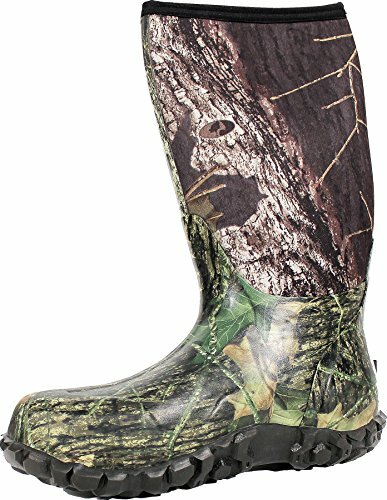 The great pair of warm hunting boots are a necessity – whether you’re waiting for ducks in a cold, wet blind or tracking that trophy buck through the deep woods, you need to protect your feet at all times. If your feet can’t last through the day, then neither will you! We’ve done the research and have information and features of the 7 best and warmest hunting boots you can find the internet. if you are looking for other warm boots, then check out our best insulated work boots or best ice fishing boots guides. These 100% Nubuck hiking boots are built sturdy and comfortable with an anatomically contoured tongue and Vibram sole that allows you to carry a heavy load of 50 lbs. or more. A big benefit when hauling pack loads of equipment into the wilderness! They are constructed with a seamless, Gortex lining to keep your feet cushioned and dry, while the perforated interior lining keeps them moisture free and cool during those long, hard treks. In addition, the Flexfit design provides natural ankle flex and heel fit for easy movement. 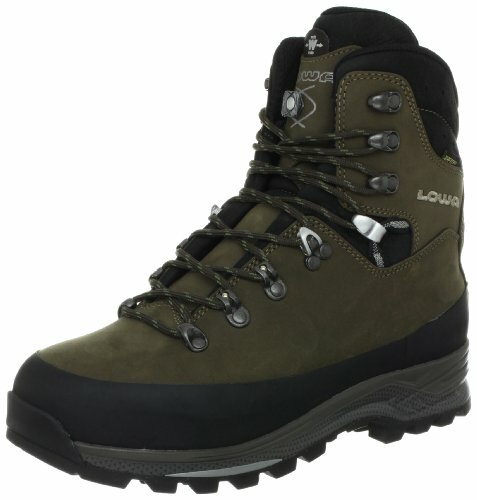 The Lowa Men’s Tibet GTX Trekking boot is ideal for hiking and mountaineering or packing in your hunting gear for the long weekend. When Mother Nature throws a curve ball, it’s important to be prepared for the elements and sure that your feet will take you where you need to go. Included as one of the best waterproof boots out there, the LaCrosse Men’s Alphaburly boots are meant for trekking through water and mud. The unscented rubber exterior and rubber soles with superior traction and flexibility, help you to keep on going until you find your ideal target. The 16” inch shaft is adorned with the green Realtree camouflage pattern so you can blend into the terrain. An embossed neoprene liner insulates your feet and legs, regulating the temperature during weather fluctuations and allow them to breathe. 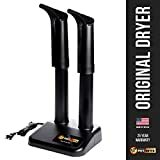 In addition, an adjustable neoprene gusset supports a calf size of up to 18” and the narrowed toe pocket grips the top of your feet and locks your ankle into place to prevent rubbing. An EVA midsole provides extra comfort and shock absorption, so the boots feel the pain at the end of a long day instead of you. These boots were constructed with waterfowl hunting in mind, but will protect you anywhere it’s wet. The Muck Boot Arctic Pro Hunting boot is one of the warmest hunting boots available with their extra thick 8mm CR flex foam bootie and a 2mm thermal foam underlay in the instep area. Not only are these boots cozy warm in extremely cold temperatures but they are 100% waterproof as well. Perfect for hunting outdoors in all of the elements. The 4-way stretched nylon wrapped shaft makes slipping the boot on and off easy. Plus, the stretch-fit binding keeps the warmth in and the cold out. A multi-reinforced and durable, tough rubber shell with a high-abrasion synthetic outsole provides great traction on slippery surfaces. In addition, the boots feature a contoured footbed and an EVA midsole comfort cushion to absorb shock so your feet don’t have to. The liner is breathable and circulates air while reflecting moisture. As cold weather hunting boots go, they are able to withstand temperatures in the range of -60° to 40° F. Be informed, these boots do not come in half sizes, so it is recommended that you purchase the next full size up. The Kamik Men’s Hunter Boot is another 100% waterproof boot that offers extra insulation with an 8mm removable Thermal Guard liner. Your feet and lower legs will thank you in extreme cold weather conditions! The Kamik brand comes from Canada – a place where the harshest weather conditions are common so they know what it takes to produce one of the best rubber hunting boots available. The adjustable waterproof nylon collar fits comfortably around calves, keeping any dampness out. 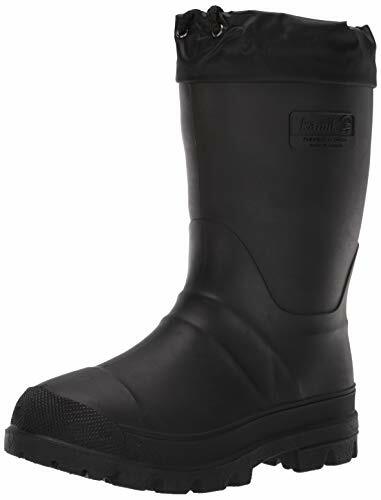 In addition, these boots feature the Kamik Explorer rubber outsole to provide excellent traction on slick terrain. These boots run slightly larger than the average boot, but a thick pair of socks will provide additional warmth and cushioning. The Kamik Hunter Boot is known for being highly durable and built to last. The Vaprtrek 8″ Hunting Boots look like a good military or tactical boot, but are highly durable and lightweight option for those who want the feel and comfort of an athletic shoe. The UltraDry construction combines a moisture management lining with waterproof components for dry, long-lasting comfort and performance. Plus, a composite material in the sole reduces the weight by 40% over a traditional hunting boot. ScentBan is added to various materials from leathers to linings to footbeds, killing bacteria that cause odors. Plus, the Realtree Xtra Camouflage will keep you concealed and out of sight. These boots are ideal for early-season backcountry hunts where light weight and extreme durability are critical. Note that a decent number of reviews report that these run a little small. Go up a size and/or pick the wide option if you want to have some extra room. And if you want the same boot but warmer, Irish Setter has you covered. 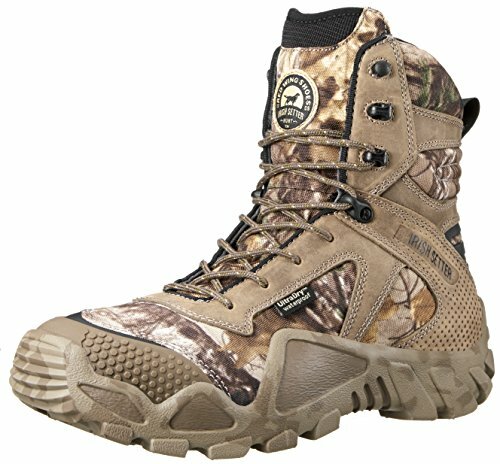 Check out the Vaprtrek 8″ 400 Gram Hunting Boot to add 400 grams of PrimaLoft insulation. If big game is what you’re after, then Irish Setter has a big game boot for you. The Trailblazer Big Game boot is rugged, durable, and stylish. They are constructed of 100% waterproof, full-grain leather and Bulls-Eye Air Bob Carbon Rubber soles for aggressive grip on rough surfaces and terrain. The shaft itself measures 7.5” and offers full support where you need it. This boot has a thin layer of Thinsulate insulation to help in the colder weather and an UltraDry lining and ScentBan technology to keep your feet comfortable. The Trailblazer works great in an terrain and is built for long hikes and long days. Bogs are one of the best waterproof boots available. The Classic High New Break Up Boot is constructed with a rubber upper, rubber sole, and is 100% waterproof. The Mossy Oak camouflage design helps you to remain undetected in the wilderness. Stay warm and dry with the Neoprene upper and removable moisture-wicking sock liner. As one of the best insulated hunting boots, they are rated to withstand temps down to -40° F. Standing in water is no issue with these boots and the non-slip rubber outsoles will keep you steady on your feet. An integrated odor guard will prevent them from smelling at the end of the day. Because of their extreme build, these rubber hunting boots aren’t as breathable as others and they tend to run smaller than average shoes. Despite these arguable faults, they are still ranked in our top 7 hunting boots and are worth the money. You’ve got everything in terms of tactical equipment but hunting can be very uncomfortable if you don’t have the right gear. Unforgiving terrain, strenuous hikes, sitting for hours, and unexpected weather conditions are all common. One key asset is a comfortable pair of boots that are built for the task, and a sturdy pair of heated socks to go with them. Socks are just as important as the boots they fit in; cushioning and protecting your feet from injury and moisture. If your feet aren’t comfortable, then you aren’t either. You need to dress for the occasion. A good camouflage blends in with the trees, grasses and other natural elements of the wilderness, so you can stay invisible to your prey. Layer your clothes, so you can stay warm when it’s cool and feel comfortable when it’s hot. Waterproof gear is also essential. Hunting is often the best in wet weather conditions, so you want to make sure that even when the weather is bad, you remain dry and comfortable. After all, you’re not out there to be miserable. There are many choices in hunting boots. When searching for the right pair, there are a few important questions you should ask yourself. We have put together a list to help you determine which boot works best for your situation. Are you going to be spending a lot of your time traveling through standing water where your feet might be splashed or even submerged? Or high grass and brush could be damp from the morning mist or there may be rain in the forecast. Hunting boots offer various levels of waterproof or water resistant materials to consider. In addition, there are different shaft heights that dictate the depth of water you can stand in. 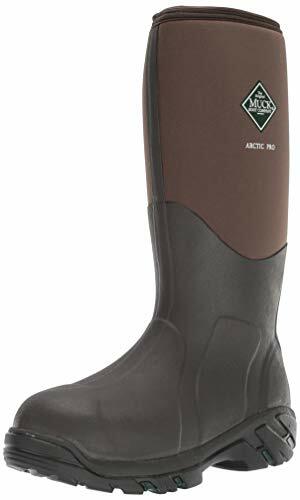 A taller boot will offer more protection for situations where you know you will be near or in water, and a shorter shaft is more suitable for wet, soggy grasses or a light rain. Another important factor to consider is whether or not you will be subjected to uneven, slippery terrain. In most cases, the answer is yes! You will want a boot that offers good traction to grip uneven surfaces or steep climbs and descents. If you will be walking up and down hills, you’ll want a boot that doesn’t allow your foot to slip back and forth in the pocket. This could cause rubbing and blisters. 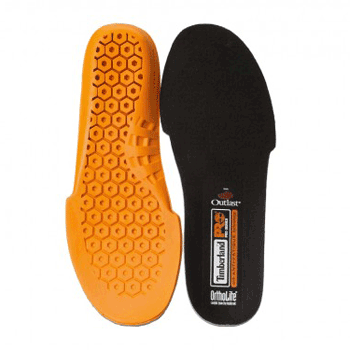 A substantial shock absorbing insole or midsole is an additional benefit for long days. Cold weather can ruin your day in a hurry and there is nothing more uncomfortable than cold feet when the temperature drops. There are varying degrees of insulation that boots offer. There is ultra-thin insulation for slightly cold temperatures or heavier, thick insulation such as fleece or neoprene. Some insulation is removable, so you can adjust your boots for warmer temperatures. Breathable liners can help eliminate sweat and control odor. 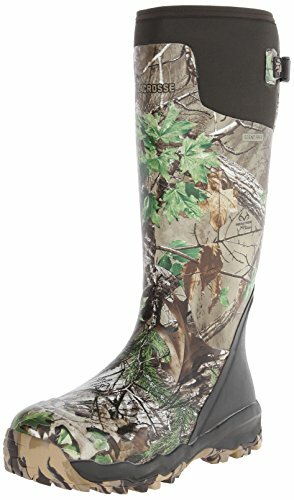 Most hunters prefer to wear boots that blend into their surroundings, and they may prefer to have a camouflage design on the exterior of the boots. As a hunter, you often prefer to remain unseen and undetected. Some boots are even constructed with a material that is completely unscented, so you don’t give away your location with the smell of rubber. Others are designed to be extra quiet. Hunting boots have many different comfort features incorporated in their construction. Features include padded tongues and collars, thicker insoles, lace up, zippers, and slip on. Questions to ask yourself are: are you going to be wearing your boots for long periods of time or will you be hiking, standing, or sitting quietly in a tree stand? You’ll also want to understand the unique needs of your feet. Are you flat footed, have wide feet, a medical condition such as plantar fasciitis? These are choices to take into consideration when you look for the perfect fit. The top 7 hunting boots above come from brands that have a long history and experience in manufacturing the top rated hunting boots. Each is a well-known name brand with a solid and proven reputation. Here’s what makes these companies stand out. Lowa was established in 1923 in Jetzendorf, Germany. In addition, they were the only outdoor boot manufacturer to be granted ISO 9001 (International Organization of Standards), which guarantees that their products are safe, reliable, and of good quality. They have gained a global reputation for great fitting boots. Another important quality of the Lowa brand is they have mastered the concept of making lightweight hunting boots that offer the same protection, durability, and support of heavier boots and incorporate softer polyurethane in their midsoles to provide more comfort and shock absorption. For over 100 years, LaCrosse has been making quality hunting boots. They specialize in vinyl and rubber waterproof hunting boots with various levels of insulation and safety features. With outdoor adventures in mind, they accommodate every season, protecting your feet from the elements and hazardous conditions. Equally important, their hunting boots are scent free and quiet, making it easier to approach game without being detected. The Muck Boot Company began their adventure in making 100% waterproof footwear and boots in 2002. Since then, they have become one of the fastest growing makers of waterproof footwear. In just a few years, they quickly established more than 20 different styles of waterproof boots. As a well-known name in quality, durability, and comfortable boots, they deserve a spot on our top hunting boot list. Since 1898, this Canadian company has been designing hunting boots to withstand severe, harsh conditions and building their boots around the elements of nature. To this day, the company is still family owned and operated. 70% of their products are either made in Canada or built in the USA, and they proudly carry that logo. Their employees are all local and some have been with the company over 40 years. 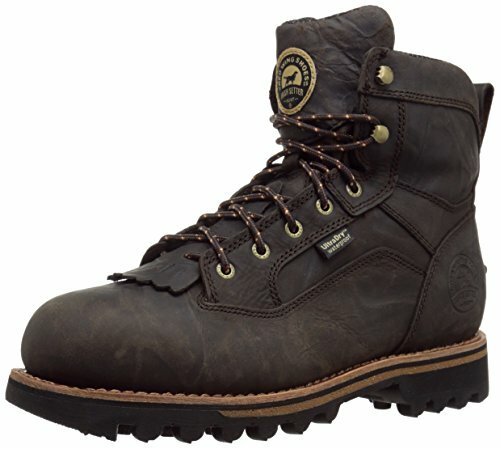 The Irish Setter brand is a derivative of the popular Red Wing brand, an American made company. This particular brand came to be in 1956, and established their logo based on the actual Irish Setter dog owned by the family and used for hunting. Their tag line was “Finest in the Field.” The Irish Setter brand introduced Exo-Flex technology to their rubber boots and RPM technology that reduces the weight of the boot significantly. They have a great reputation for making hunting boots. A brand that offers a 100% satisfaction guarantee must be confident in their product. As one of the top hunting boot brands available, they have made a quite a reputation for themselves. Established in the Pacific Northwest of America in 2002 (where the weather changes in a blink of an eye) Bogs hunting boots are manufactured accordingly. They design comfortable hunting boots for uncomfortable conditions. Weatherproof, waterproof, terrain proof, you name it and they have it. Now that you have seen our top best hunting boots and what they have to offer, you have the information you need to make a choice from our short list of great options. Our honest reviews include the best brand names that have established an excellent reputation through years of experience. Pick your pair and be ready for anything on your next hunt!